“A senior government minister, Eric Abetz, has faced criticism from the Australian Medical Association and the Breast Cancer Network of Australia for giving credence to a debunked link between abortion and breast cancer. As a result Abetz was hot property and he was keeping his head well down when flying into his home town by chartered aeroplane late on the night of Friday 8th August 2014. The saga of this chartered flight has taken me some time to resolve. It was first flagged on Tasmanian Times on the 18 May 2018 where I posted my email letter sent to Senator Abetz dated 17 May 2018 regarding the reasons behind a chartered flight on the evening of Friday August 8th 2014 which was taken by him from Launceston to Hobart. At this time Abetz raised the subject of the expense of sending two ABC reporters to London by business class air travel. In fact they travelled economy class to cover the wedding of Prince Harry and Meghan Markle. This nasty bit of troublemaking prompted me to complete my investigation by FOI into his use of a chartered flight within the island of Tasmania. Charter flights by Ministers of the Crown are high profile events and open to abuse, and as such are supposedly closely monitored by the Independent Parliamentary Expenses Authority, the IPEA. From my dealings with this government quango they appear to be far from Independent, and their interests appear closely aligned with those of their political masters. Abetz was the Special Minister of State responsible for passing into law “Procedural Rules No 1 of 2005”. This defines the Entitlements and Allowances for Pollies when traveling away from home to attend Parliament, Parliamentary Committees, Party Meetings, overnight stays, official government, parliamentary or even vice regal functions. He is therefore an expert in this esoteric field. 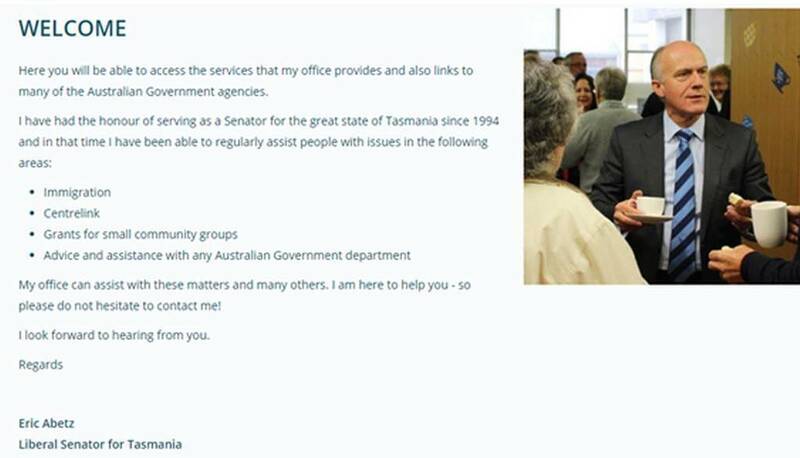 Abetz has never replied to my repeated requests as published on Tasmanian Times yet his website states ‘I am here to help – so please do not hesitate to contact me’. This platitude does not seem to apply when it comes to the history behind a chartered flight “in the service of his electorate” so I was forced into an FOI request the results of which are detailed below. The Independent Parliamentary Expenses Authority has tried to block my investigation by refusing to release all the details of the two Com cars used to pick up Abetz in Hobart after the aircraft from Launceston had landed. The car needed to take Abetz to a political function to justify the charter of the aircraft the destination was blocked out under section 47F. This posed the question – why? 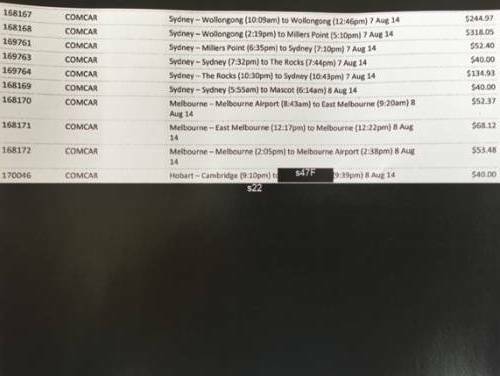 Blacked out destination of Com car that collected Abetz from the airport on the Friday night. Detail of the above, the destination is deleted. 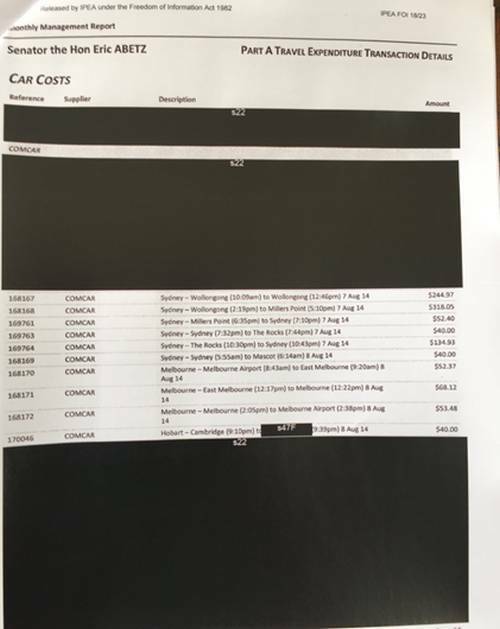 The other Com car all details at Hobart have been completely deleted from FOI. As I have made plain in my correspondence with the Department, if Abetz went home directly from Cambridge airport to Blackmans Bay where he lives, the reason for the flight was personal, and such usage does not justify an Electorate Charter. Further, as there were two Com cars involved, Abetz could not be in both. Who was in the other car, and where did it go? Who signed off on the chit, and where is that document now? Did that person travel on the aircraft from Launceston? If so, why was that person not listed as a passenger, and why was this not recorded in the Charter documents, and why was the charter not authorised by the Special Minister of State? 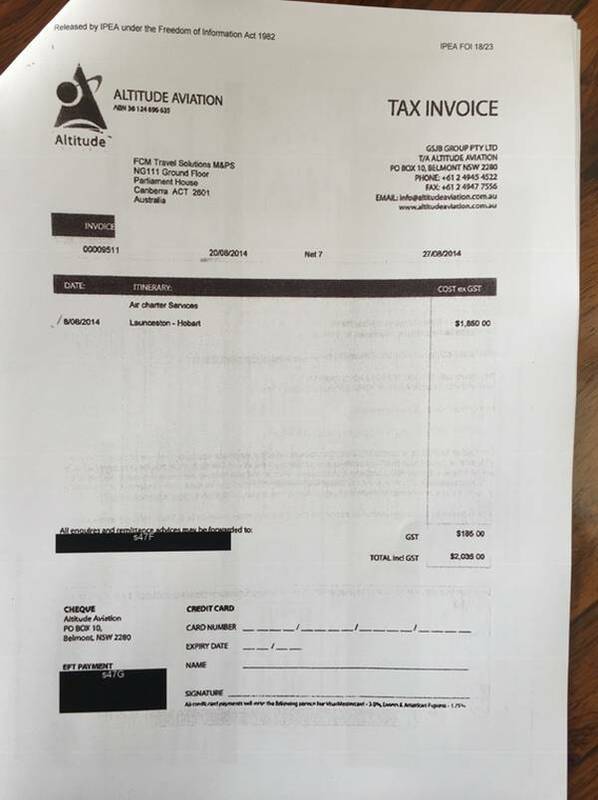 Shown below are the Invoice for the Charter and the two pages of Authorisation for the charter giving no reason for the flight, no evidence of involvement by the Special Minister of State, and no evidence of another passenger … which begs the question why the extra Com car at $70 plus for the journey? 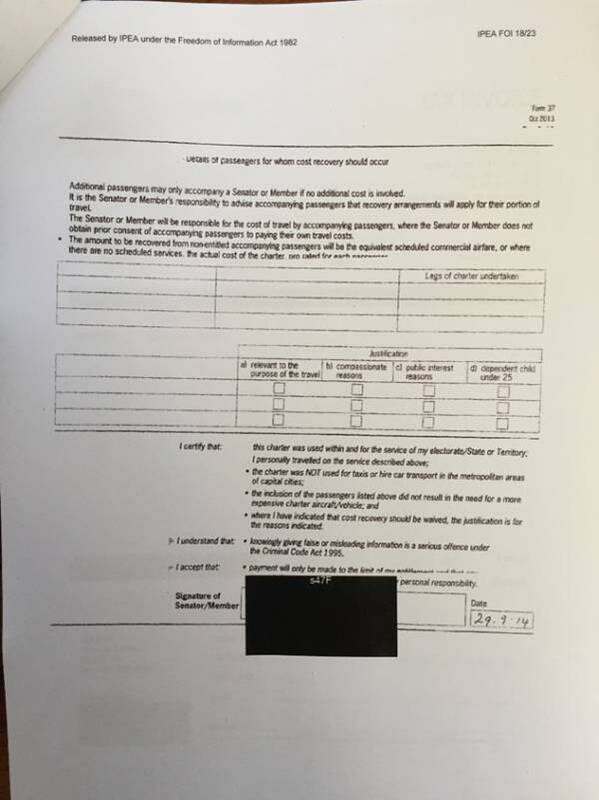 The second page with no passengers stated, as signed by Abetz, and dated over a month later. No reason has ever been forthcoming either from Abetz or the so called Independent Parliamentary Expenses Authority as to why they were required to block out the Com Car details of a highly important piece of information not released under FOI. 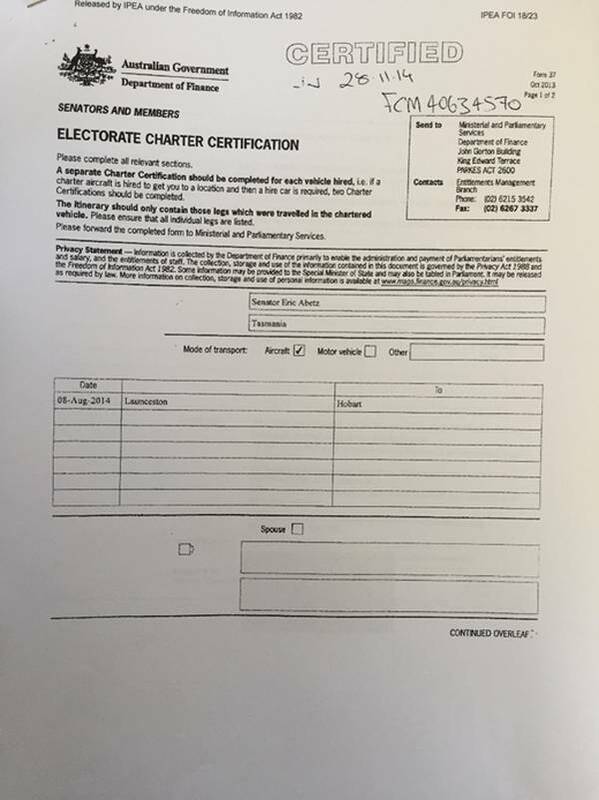 This poses the question .. has the IPEA asked Abetz where he went and then agreed to the destination being blocked out to protect themselves over a claim that they had negligently approved as unacceptable Electorate Charter? Why is the other Com Car deleted entirely from FOI declaration? Abetz cannot be in both cars at the same time! 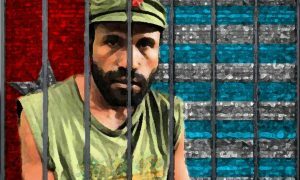 Where is the independence of the Authority? 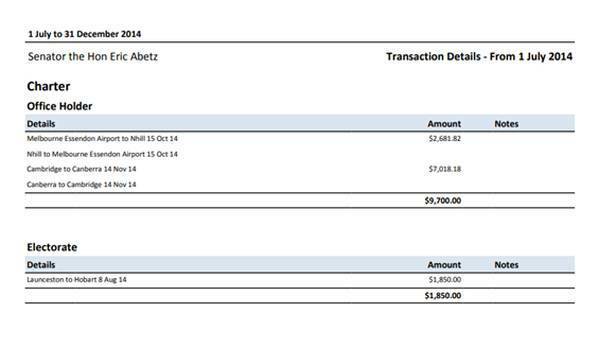 On this evidence, are they protecting Abetz over a fraudulent claim? I challenged this exclusion over detail regarding the Com cars, but I was fobbed off by Melinda Kopilow in an email dated 1 November 2018. I will now apply for a review of the IPEA decision … unless Abetz would finally care to comment. We just need to clarify the terms of your request with you. •	You state that you request “a copy of all the[s]e documents under FOI”. Are you able to confirm that the documents you seek access to here are Senator Abetz’s travel expense claims on 7 and 8 August 2014? •	You also requested “under FOI [Senator Abetz’s] diary entries for the 7th/8th August, 2014 as the Minister for Employment”. Please let us know if you would like to revise your request by 3 September 2018. If we do not receive a response from you by this date, we will treat your request as withdrawn. 1. I refer to your request, received by the Department of Jobs and Small Business (the Department) on 5 September 2018, for access under the Freedom of Information Act 1982 1982 to documents and information regarding Senator Eric Abetz’s travel expense claims and ministerial diaries. 2014 and Friday 8th August 2014 regarding his use of Taxis or Commonwealth Cars. “The Project” evening interview where he linked abortion to breast cancer? 3. He was still in Sydney on the morning of the 8th August when he flew to Melbourne. He went in and out of Melbourne that day in a Government car. Why from his diary? days that either relate to, or will throw light on, why he needed to charter an aircraft to fly from Launceston to Hobart. 4. On 7 September 2018, the Department notified you that it intended to refuse your request on the grounds that a practical refusal reason existed, i.e. you did not provide enough information as was reasonably necessary for the Department to identify the documents you were seeking. 5. On the same date, you revised your request to the scope set out a paragraph 2 above. 6. On 20 September 2018, the Department notified you that it was required to consult with a third party individual whose personal information appeared in the documents covered by your request, and that the time period for processing your request had been extended by 30 days to allow for this consultation. A (Schedule) summarises my decision as it applies to the documents covered by your request. 19. I consider that special circumstances exist in relation to this matter. The travel expenses of parliamentarians are a matter of ongoing controversy and public debate. 28. You have requested, in Items 2 and 3 of your request, access to documents relating to charter flights taken by Senator Abetz, and Senator Abetz’s ministerial diary entries. Please note that the department would not normally hold copies of ministerial diaries. Further, the department does not have portfolio responsibility for parliamentarians’ expenses and would not normally hold documents relating to charter flights taken by parliamentarians. Nevertheless, the department has conducted searches of its record keeping systems for copies of the documents you requested. I am satisfied that the documents you requested under Items 2 and 3 of your request do not exist in the records of the department. The Department of Jobs and Small Business then released the vital piece of evidence showing that Abetz went home in a Com car from Hobart airport. 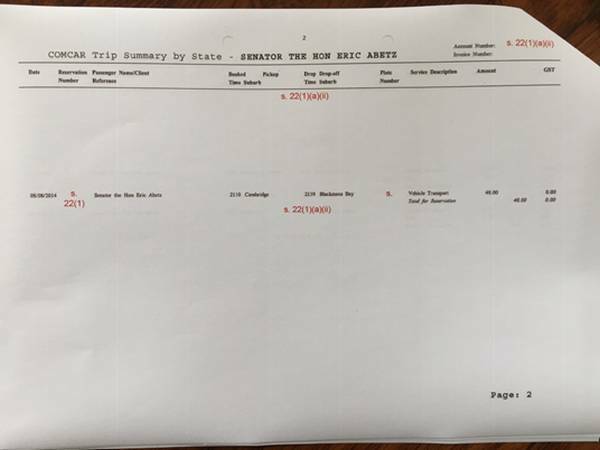 The above document proves that Abetz was collected by Com car from Hobart Airport (Cambridge) at 2110 on the arrival of his chartered aircraft, and he was then delivered to his home at Blackmans Bay at 2139 at a cost of $40. The record of the second Com car appears to be missing. How can this be and why was this crucial information blocked out by IPEA? So there we have it. Abetz chartered a plane from Launceston to return home late on a Friday night. This still leaves unexplained the other Com Car. Where did it go, who was in it, who signed the chit, and did they travel on the aircraft un-declared by Abetz? I understand that knowingly giving false or misleading information is a serious offence under the Criminal Code Act 1995. The Ministerial Diary and all documents relating to the flight seemingly no longer exist. I ask – why not? The fact that, despite repeated polite requests to produce the documentation regarding the chartered aircraft, Abetz has seen fit not to reply. Where is the Ministerial Diary, and where is the documentation giving the reasons behind the Charter and the approvals from the Special Minister of State? Has he destroyed the documentation, and if so, when, and was this subsequent to my initial request of him? In chartering an aircraft to return home on a Friday night, Abetz seems to have committed a fraud on the Public Purse, and I feel he must therefore refund the money and immediately resign from the Senate. To this end I am asking that this matter be raised in the Senate. Once this is resolved Abetz I will move on to another charter flight in this six month period. Abetz, like a Prince of the Blood, took a day return chartered flight from Hobart to Canberra to attend a Parliamentary Committee meeting starting at 0830 at a cost of over $7,000. He arrived late. The previous day he had been in Melbourne and then flew to Hobart. Why did he not remain in Melbourne instead of flying to Hobart with the full knowledge of what was for him a most important and contentious Committee Meeting at which, as the relevant Minister, he was the star attraction starting the following day at 0830 hrs in Canberra? Did he forget and did the taxpayer spend $7,000 to correct his memory lapse? Who authorised the flight? What is the Abetzian excuse for this incredible expense, and why did the plane wait and then take him back to Hobart? As the Minister for Employment, his comments before the Committee over jobseekers and 40 interviews a month, should be viewed in the context of chartered jets waiting on the tarmac to take him home to Hobart .. all with Com cars at the ready. Abetz addresses the Committee having arrived in Canberra by chartered jet. Why was it beyond his control? He had just spent $7,018 dollars of taxpayers’ money to arrive on time. Nothing about this is very surprising in what it demonstrates about the lack of transparency of the political system in general, whether in Tasmania or at national level. In that sense it is easy to look at this material and see it as par for the course, and just another example of the normalisation of the abuse of proper standards of due process and integrity by elected officials. What is significant is how it reveals the extreme determination of politicians, like Abetz, to avoid accountability in how they use public funds, and the lengths to which they are prepared to go to hide their political activities and avoid public scrutiny. One interesting question about what John Hawkins puts on the public record is the extent to which Abetz exemplifies a broader malaise, and how deep that might extend. We are well aware of the more open culture of spending public funds via money-laundering operations of political parties. It operates by public subsidisation of corporate interests, which is partly ploughed back into party campaign coffers, something which Tasmanian Liberals, and the ALP as well, see as essential. Abetz is an interesting case study, in a number of ways, because he has long exerted a strange and strangulating power over Tasmanian Liberals, and reduced them to quivering minions, while actually doing nothing positive or progressive for Tasmania. In fact, everything Abetz has touched has been destructive in one way or another, from forestry to socio-economic issues and human rights. Everything that Abetz does is divisive, backward and negative, focused on exclusivity – or is it exclusion? – rather than anything ecumenical or inclusive or egalitarian. Tasmania produced Abetz, just as Queensland produced Dutton and Bjelke-Petersen, but what has he done for Tasmania .. except damage? And PING … it seems the good Senator raised the issue of the sexual assault of Ashleigh Raper under Parliamentary Privilege in Senate Estimates – not a good look, and arguably he should resign .. given the activities of the last few days in NSW – and well overdue. George Carlin once observed that “It’s a club, and we ain’t in it” or words to that effect. Time for the senator to leave. Keep up the good work. It will be interesting to see which journalist picks this up. I suggest bringing it to the attention of Mike Carlton, who claims to be totally apolitical.